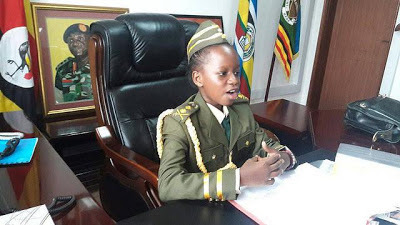 Angel Tyra Muwanguzi an eight year old pupil of “Train Up a Child Primary School,” Bugolobi, Uganda, replaced General Katumba Wamala as the country's Chief of Defense Forces. The petit soldier's reign lasted all of 10 minutes. 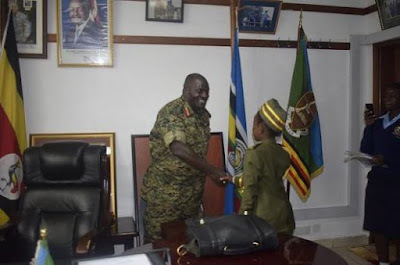 The ceremony was organized by Ugandan wing of Plan International together with Gals Forum International, a local NGO as part of the events organized ahead of the International day of the girl child scheduled for 11th October. 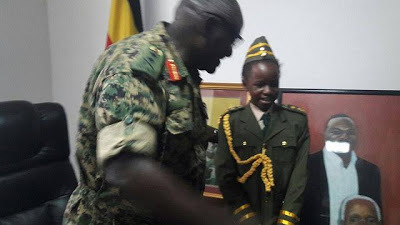 The idea is to demonstrate that girls can perform duties that men do. 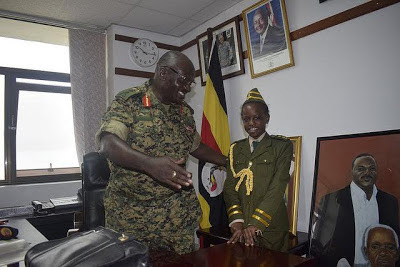 “We want to demystify the accessibility to this office and so are pleased to be a part of this event to support and inspire girls on this memorable day,” Gen. Katumba said after the event. 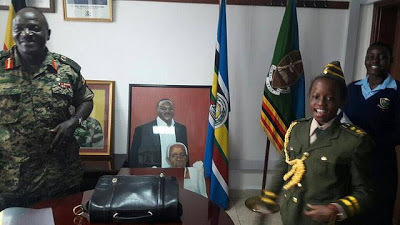 Plan International Uganda’s Head of Programmes said, “We have closely worked with other government line ministries but rarely with the Defense ministry and so this is a rare and special occasion for us which we hope to be the start of a strong partnership to fulfill girls’ rights.”Key issues highlighted during the meeting included: Recruitment of more women into the army as well ensuring daughters of the army too can learn, lead, decide and thrive. “The Integrated Early Childhood Development Policy has been launched by the Government. We wish to see ECD centers for army children as well” a top officer of Plan International Uganda noted.